Bell-Arista Era and Wolf Johnson..
Well 2008 was a world wind year traveling to Europe and around the Americas. It was a special honor working with the new lineup of drifters for this day an time. surrounding the Legendary Group an name. songs from 50s, 60s, 70s and some new song for 2009. Also on the cards is a possible world tour with both groups. around the group an who's really who..
Also beware of those who claim to had been legitimate Drifter lineup members.. 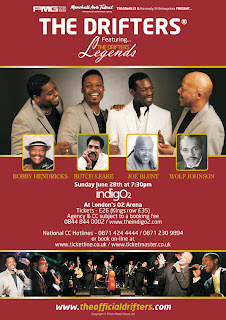 The Five Decades & Moore Drifters Tour which began in the early part of the year is doing well with sell out audiences. singer of The Drifters who passed away in 1998. The usual suspects were there showing off there skills in this all season event.